Upper sinking creek is much like the sinking creek section more commonly run, that empties into the Current River above Round Spring, except being many miles up into the drainage are, which seems extensive to me, it has less water. However if you are waiting for it to get big water, you are making a huge mistake. The rapids are Cl-II at most, however this run has a feature that no other creek in Missouri has. It comes up to a bluff wall, and then runs through it, about 150 feet of caverns, and then comes out the other side. And therein lies the tale. If you put on at too high a level, you find that the river disappears in a swirling vortex, with the tunnel completely under water. A portage around the bluff is possible, I suppose, but the bluff is probably more than 50 feet high, and I can’t imagine the portage needed! On the day we did it, Willow Dave, who had been monitoring levels periodically as he travelled past, gave us a call. It was time to do it. NOW. Di and I were ready and we loaded kayaks and headed to the put-in. The put-in is, coming from up-creek, the second bridge you cross. The creek will be going to your left. The parking is good and you can easily get three cars there. Willow Dave, Bill Fordyce and his friend had canoes. The creek was just barely up enough to float our boats. There was a bit of scraping, but we never had to get out of our boats and drag them. The run is fairly long, and we stopped for lunch. By then another creek had come in from the right, and we had plenty of water. 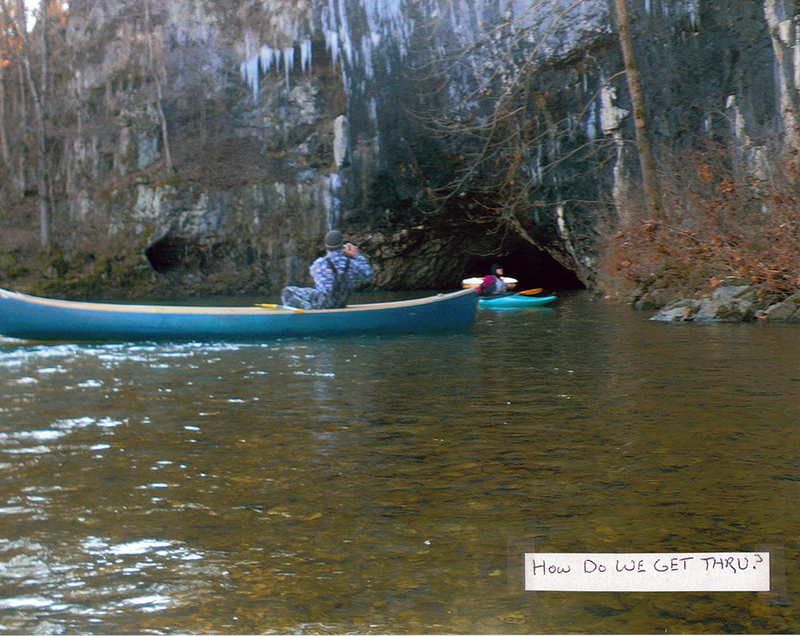 It was cold, so lunch didn’t last long and soon we were back in our boats and soon enough came to the bluff wall with the cave entrance. How do you rate this? 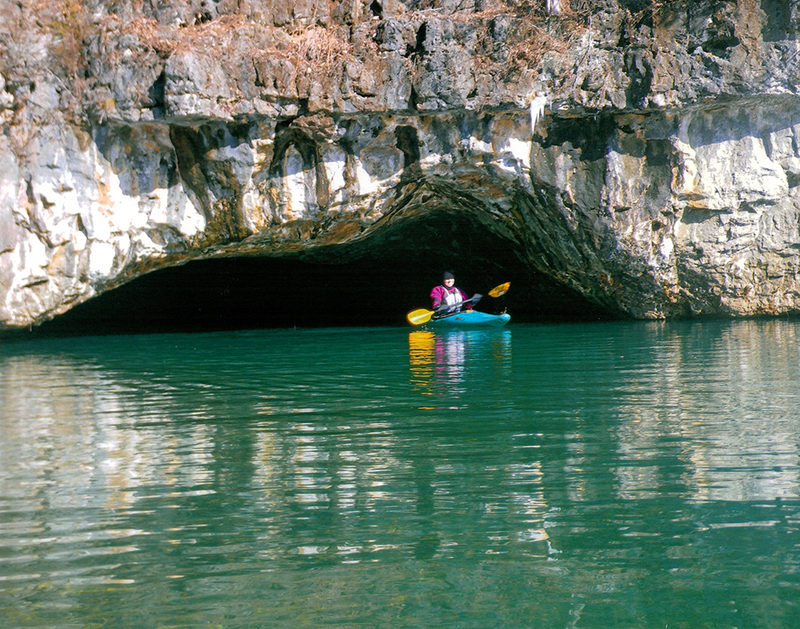 There is no rapids in the cave, just gentle current, but at times we had to lean way back on the decks of our boats and hands our way through by walking the ceiling which was inches from our nose. The canoers lay inside their canoe and did the same. I heard one canoe scrape the ceiling. When we first entered, the exit was a smallish dot of light and we just aimed for it. It got quite dark, and we had lights, but they didn’t do much good when you were on your back. The exit got gradually larger and soon we popped out into sunshine that seemed way too bright! So, If you have a major case of claustrophobia- this would definitely be a Cl-V experience! The rest of the run was a delightful creek run, very fast and busy. The take out was a low water bridge on the same road we use to get to our September picnic get together.